I still hesitate to find an answer that's accurate, honest and at least a little bit interesting. 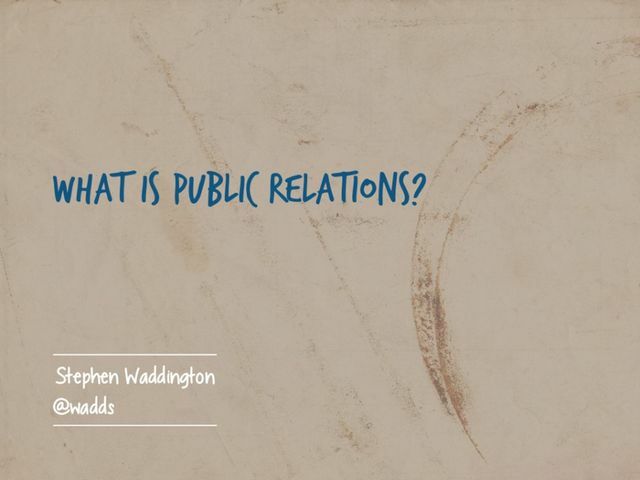 Thankfully, friend and colleague Stephen Waddington has compiled an updated discussion on PR - where it was, where it is and where it's going - that he's generously shared below. You probably won't fire up PowerPoint at the next cocktail reception or Sunday dinner with your parents, but you might get a few points worth remembering. My own view, for it's worth, is that PR is about helping an organization or a brand understand and meet the expectations of the communities it needs and serves. Slightly inelegant, I guess, but it frames a wider conversation for those truly interested, and meets the needs of those asking out of politeness. Anyway, take a look at this and let us know what you think.